Finished night shift and went out for breakfast with some of the people I work with. Roy’s Coffee Shop here in Strathroy. Slept until noon. It is kinda gloomy outside. Overcast. Windy. And I am enjoying some Keith Jarrett jazz (Live at the Blue Note) while drinking coffee down in my study reading The Confessions of Nat Turner. Received an email from Who’s Alive, Who’s Dead, that Davy Jones of the Monkeys died today of a heart attack. 66 years old. I am staying put inside relaxing and reading today. Tomorrow I am taking Abby to Kilworth for her spa day. And will pick her up in the afternoon. Carol is spending Thursday afternoon in pre-op in London. Her surgery is scheduled for next Tuesday. This afternoon, as I was taking out the garbage, I heard a familiar song. I looked around, and high up in the tree, not far from the house, was an AMERICAN ROBIN. Saturday morning found the Strathroy area with cold temperatures, high winds and blustery snow. This continued until early afternoon when the wind died down, the snow stopped falling and the sun came out surrounded by lots of blue sky. So the 16 participants in the Owl Prowl had excellent weather conditions for their trip. We met at the seniors centre parking lot in Strathroy and from there headed out to the School and Seed Roads area. School Road, Cuddy Drive and then Seed Road all north of Egremont were driven VERY slowly. The fields, trees, bushes, fence posts, etc were scoured by 16 pairs of binoculars. We looked anywhere a SNOWY OWL might be found. The group did see quite a few SNOW BUNTINGS and HORNED LARKS, but no SNOWY. Eventually we crossed Egremont Drive headed south on Seed. And then we saw it. Way off in the field. A VERY white SNOWY OWL. All the searching had finally paid off. During the drive down the back roads, as we worked our way down to the Melbourne area on Mayfair Road all the way from Calvert Drive to Hyndman Drive, we encountered several rather large flocks of SNOW BUNTINGS (1,000′s), an AMERICAN KESTREL, a SHARP-SHINNED HAWK, several RED-TAILED HAWKS, and HORNED LARKS. 4 White-tailed Deer, standing off in a field near the edge of a wood lot, observed us with some trepidation. We arrived at Hyndman Drive about 6 PM and we were greeted with a sighting of 8 TUNDRA SWAN flying overhead in a westerly direction. As we slowly drove along Hyndman, 7 or 8 NORTHERN HARRIERS were seen coursing over the fields and crossing from one side of the road to the other. A small flock of CANADA GEESE flew in a landed off in the field. Eventually we pulled our vehicles off to the side of the road, turned off the motors and just sat and watched. Right around 6:30, two or possibly three, SHORT-EARED OWLS flew up from a marshy area along side of the vehicles, crossed the road in front of us and went out over the field to the north. By this time, it was quite dark and the owls were soon lost to sight. Time to head back towards town. Along the way, we stopped at several woodlots and called for EASTERN SCREECH OWLS. We stuck out on the first 3 attempts, but on the fourth attempt, 2 owls responded. One daring owl even came out and landed on a thin branch right at the edge of the trees within 6 or 7 feet of the vehicles, giving everyone excellent views of the beautiful little bird. And that ended the Owl Prowl. A very enjoyable and rewarding time was had by all. Some time ago, I decided that on February 25th, I would take off in the afternoon and do an owl prowl. I intent is to see as many SNOWIES, SHORT-EARS, SCREECH OWLS and GREAT HORNS as possible. I plan to start at 3 PM and finish around 8 PM. Of course, there will be other birds along the way. I was kind of hoping for bare land to make for easier visibility of the SNOWIES, but it is what it is. Looking forward to it. Fun is the name of the game. Yesterday morning I drove into London, Ontario to Springbank Park (30 minue drive from my home in Strathroy). A ROSS’S GOOSE has been present there since last week. 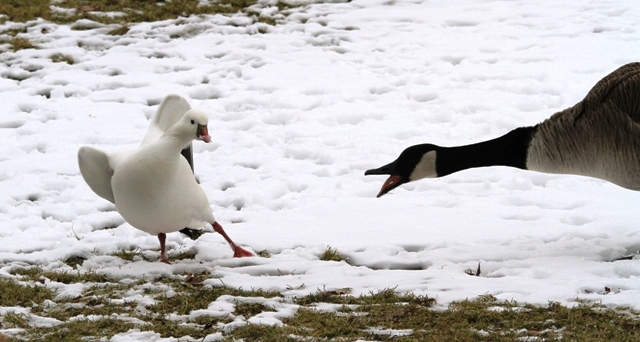 I had only seen one other ROSS’S GOOSE and that was many years ago. The ROSS’S is “hanging out” with a flock of CANADA GEESE. It was interesting to watch the way it was dominated by the CANADA’S and made me wonder why it puts up with the harassment. The ROSS’S GOOSE breeds in the high arctic tundra and migrants down thru the central portion of the North American continent. 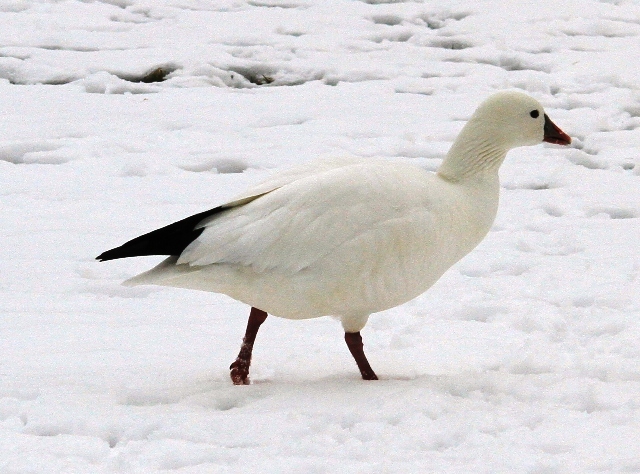 It is a regular but uncommon winter resident in southern Ontario. It is a very beautiful goose and I’m glad that I had a chance to see it. Just worked three night shifts. Now a couple of days off. This afternoon I was busy answering emails and reading. Finished reading KINGBIRD HIGHWAY by Kenn Kaufman. I really enjoyed this book. It was very well-written and pulled me into the story-line. It felt like I was traveling along with Kenn and experiencing and feeling the things he was seeing and doing. Kaufman was like a Jack Kerouac of the birding community in the early 70’s, when birding was really taking off. I didn’t get into birding until about 10 years later (early 80’s). But from my reading and studies of the birding community, I recognized many of the people Kaufman wrote about or mentioned in his book. After supper, I squirred myself away downstairs and started in on my next book: THE CONFESSIONS OF NAT TURNER by William Styron. This book won the Pulitzer Prize for Fiction for 1968. I hope it is a better read than the Pulitzer Prize novel I read at the end of 2011. This year is already moving ahead quickly. Can’t believe that we are nearing the end of February. I think part of the reason time goes so fast is because I am working full-time. And when it comes to work, I am.quite torn in opposite directions. I am building a nice little nest-egg. I want to go to Alaska (to Gambel, Alaska, actually)And a trip there does not come cheap. And I’m not sure I want to go by myself. But working full-time when you really don’t need to has a price. And that price is time. It robs me of time to do all the thiings I enjoy. I am not reading as much as I did before starting the job. I don’t have the time to bird as much. I am more tired than I’d like to be. And I am eating and snacking more, which isn’t healthy either. I keep asking myself: “How much longer?” Right now, I am telling myself another year, that I will quit a year from now. We’ll see. 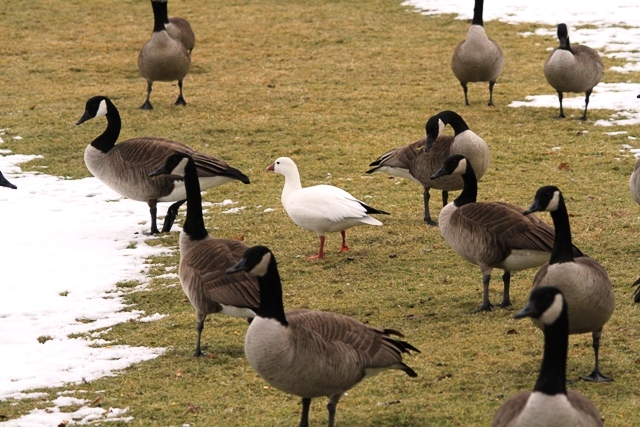 A ROSS’S GOOSE has turned up in London at Springbank Park. I think I will head over there tomorrow morning and see if I can find it. Another very spring-like day. Temperatures above freezing. Blue sky. And after reading Erin’s blog post about seeing 3 Pileated Woodpeckers at the Strathroy Conservation area, I just had to take some time out today and head over to the trails. At first it seemed very quiet, but eventually it seemed the birds started to wake up, singing and calling. The NORTHERN CARDINALS were especially vocal. BLUE JAYS were calling. CROWS were flying thru the trees. BLACK-CAPPED CHICKADEES were popping around from branch to branch in the trees. RED-BELLIED WOODPECKERS were calling. I heard BROWN CREEPERS but could not spot one today. GOLDEN-CROWNED KINGLETS put in an appearance also along with WHITE-BREASTED NUTHATCHES. It really felt good being out in the fresh air today. Put a positive smile on my face. Spring was definitely in the air. Skunk Cabbage is even coming up. Seems early for all this, but winter just hasn’t left its stamp on things this year.